Here's what B. Riley Financial had to say about Rent-A-Center's recent move, and what investors need to know. After slumping 10% on Tuesday, shares of Rent-A-Center (NASDAQ:RCII), a rent-to-own leader retailing products such as consumer electronics, appliances, computers, and furniture, among others, have more than recovered Wednesday, with shares climbing 13% as of 4:00 p.m. EST. 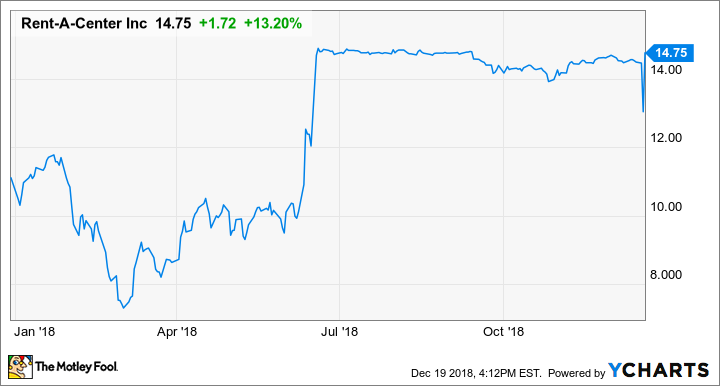 The driving force was from B. Riley Financial (NASDAQ:RILY) announcing its support for Vintage Capital -- let's cover what exactly happened in this six-month story. The story begins with the announcement on June 18, 2018, that Vintage Capital would acquire all of Rent-A-Center common stock for $15.00 per share in cash. At the time, the move was unanimously supported by the Rent-A-Center Board as it offered investors an immediate premium of roughly 50%. Fast-forward to Tuesday: Rent-A-Center announced it had terminated the Agreement and Plan of Merger with Vintage Capital, and the former agreed to pay the reverse breakup fee of $126.5 million within three business days. Today, though, B. Riley Financial, which was serving as a financial advisor and lead arranger for the deal, announced its support of Vintage Capital and believes that Rent-A-Center's purported termination was invalid. For investors, there's no reason to lose sleep over this development as it's out of your hands. However, the development and stock price does emphasize a couple of things. Keep in mind that Rent-A-Center's third-quarter results were solid, with same-store sales rising 5.7% and beating both bottom-line and top-line analysts' estimates. In fact, year-over-year revenue increased for the first time since late 2015, and it's possible the momentum has changed management's mind that selling is the best course of action. Another takeaway is that with the stock not far away from its $15.00 acquisition price, perhaps Wall Street sides with B. Riley Financial, and the deal still might go through.